Your dream kitchen will be custom built with you and your budget in mind. Most kitchen and bathroom remodelers buy pre-made standard sized cabinets or they buy cabinets from an outside source, but at Alliance Remodeling we have our own custom cabinet shop. Our cabinets and countertops are customized to provide you with a kitchen you will love and be proud of and one which will add value to your home. 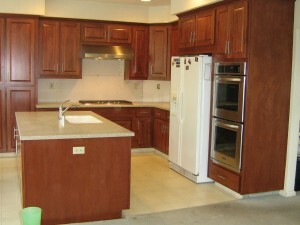 This Folsom kitchen has beautiful cherry cabinets. Ceramic tile back splash (some pics were taken before backsplash was installed). 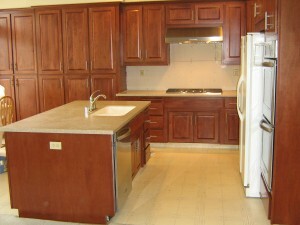 Granite counter tops with kitchen sink in the island and a cook top built into the granite counter. 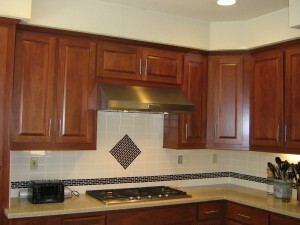 The soffits were custom built to match the new cabinets. My Cell Number Is 916-801-7737. With 29 years of remodeling experience I will look at your remodeling ideas and make recommendations to what would work best for your space and what would be best to increase the value and functionality of your kitchen. I would love to hear about all your great ideas and help you make your dream come true. We are family owned and operated, licensed and bonded. We provide quality craftsmanship, we guarantee our work and are mindful of your budget. Know Exactly What Your Getting!